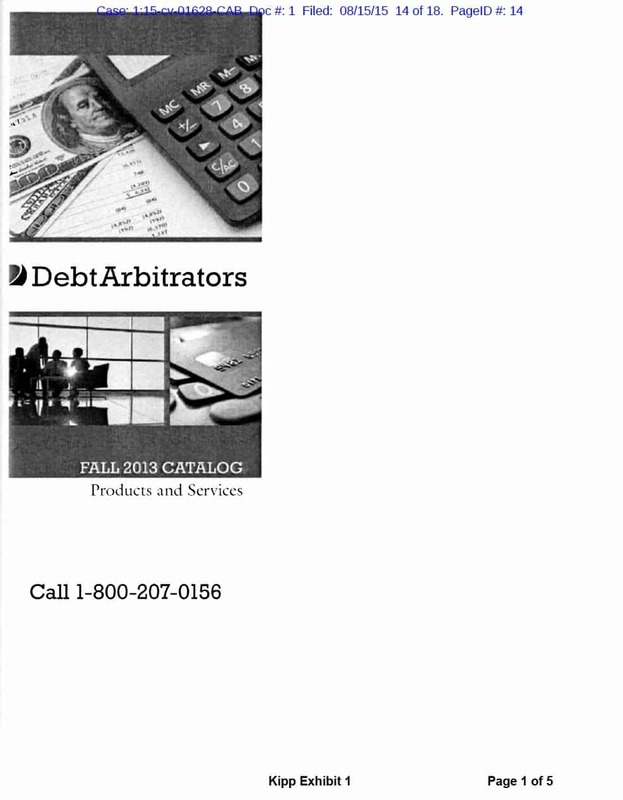 I think debt relief companies often get the wrong impression about why I write articles about debt relief lawsuits. It’s not to call out the company named but to help other companies see what strategies are being used to challenge debt relief companies. In this suit the Plaintiff used an interesting approach and target the very method by which mailing lists were generated. An interesting strategy. The case was presented by Paul Kuzmickas and Matt Alden with Luftman, Heck & Associates. Of course, the final disposition of the case will need to be be determined by a settlement or the court. Until then, here are the challenges made and facts alleged. 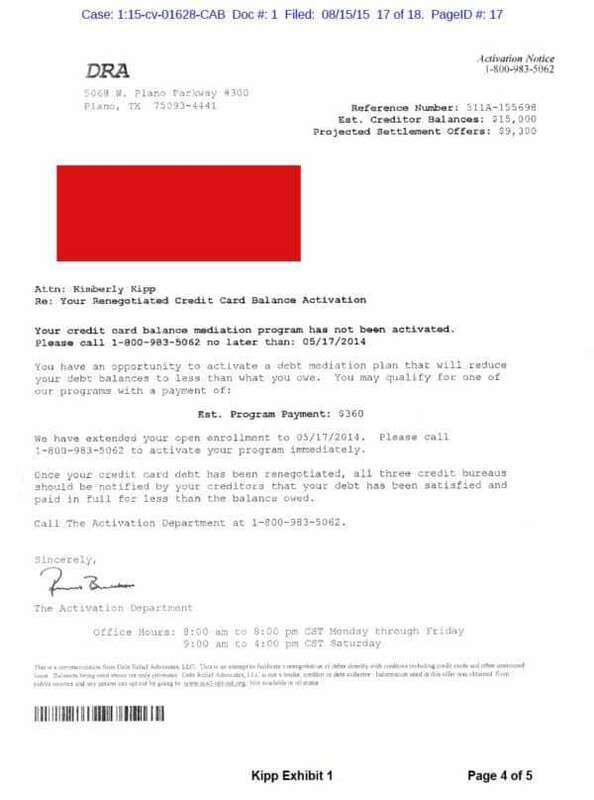 Kipp is a resident of Ohio and received marketing material from Debt Arbitrators, 350 N. Sait Paul Street, Dallas, TX. 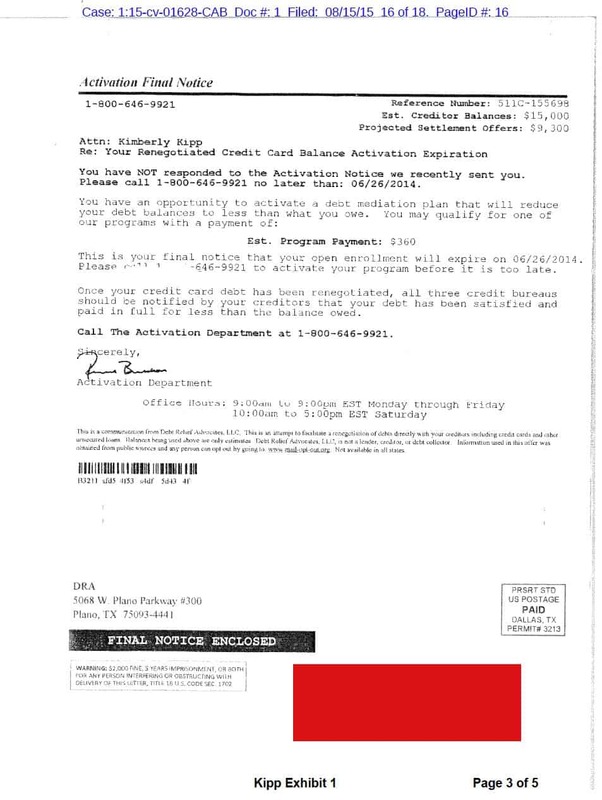 Debt Relief Advocates, 5068 W. Plano Parkway, Suite 300, Plano, Texas was also involved in this relationship. 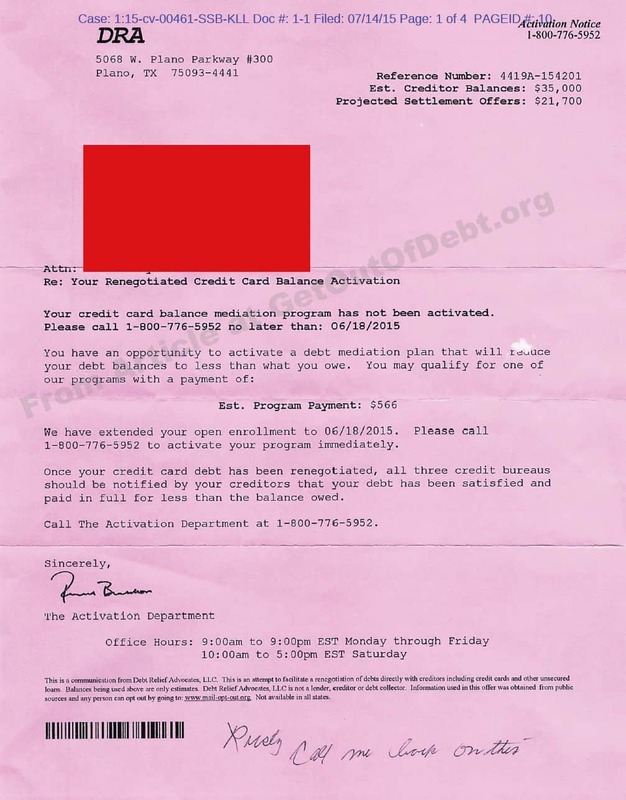 The Plaintiff alleges both companies regularly solicit consumers for debt settlement services. “In order to target their marketing, Debt Arbitrators, LLC and Debt Relief Advocates, LLC obtain lists of consumers, including a list with Kipp’s information, who maintain high credit card balances and other factors that indicate financial distress. Upon information and belief, the list at issue originated with a consumer reporting agency. The defendants knew or recklessly ignored the fact that they were obtaining data which originated with a consumer reporting agency. 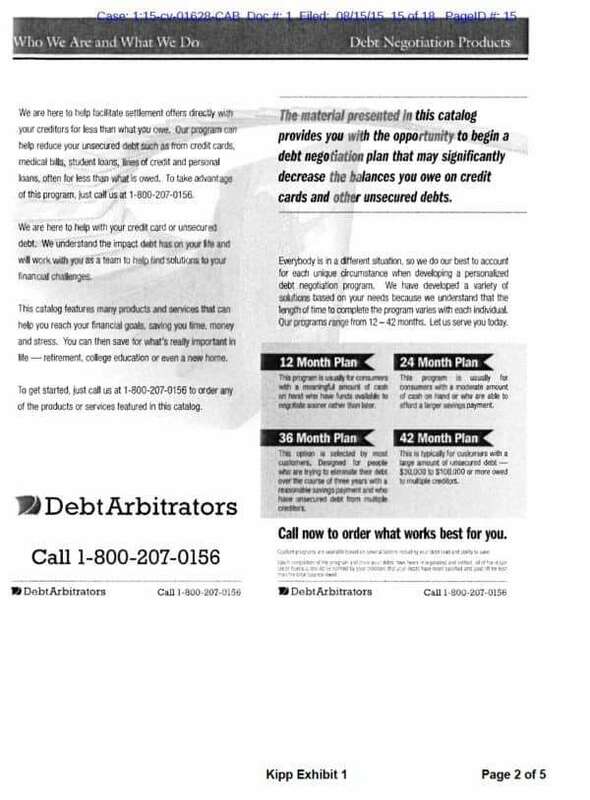 Upon information and belief, Debt Arbitrators, LLC and Debt Relief Advocates, LLC either directly, or through other marketing agents, obtained information on Kipp’s credit worthiness, credit standing, credit capacity, character, general reputation, personal characteristics, or mode of living from a “consumer reporting agency” as defined by the Fair Credit Reporting Act, 15 U.S.C. §1681a(f). 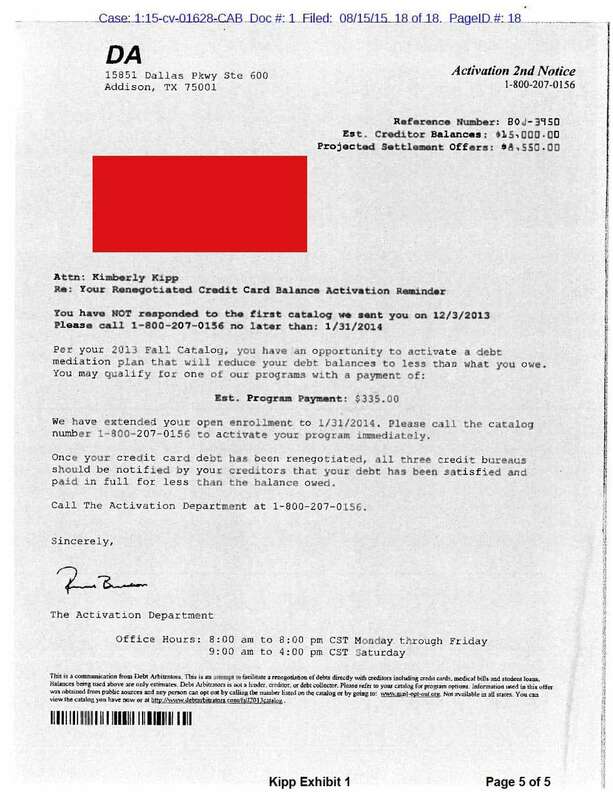 Upon information and belief, the defendants used the impermissibly obtained information to market debt settlement services to Kipp. The information is therefore a “consumer report” as defined by the Fair Credit Reporting Act, 15 U.S.C. §1681a(d). The defendants compiled the consumer reports in a joint venture to advertise, promote and operate a business of soliciting clients for their debt settlement and credit counseling services or for the services of other companies. What is not clear from the case, to me, is how the information was obtained to market to consumers. Was it generated from a credit report or from a purchased marketing list from a credit bureau? That seems to make a huge difference. So that is an interesting approach. It seems the allegation is that by furnishing the debt relief companies some information based on the consumers financial reporting the companies received a “consumer report” and were then able to make some determination on the qualification of the consumer for the program. The suit goes on to allege the failure of the debt relief companies to register to do business in Ohio created more problems. Actually the registration issue is one I’ve written about over and over again for years. i. falsely claimed Kipp owed balances of $15,000.00 falsely claims settlement amounts of $8,550.00 and $9,300.00. iii. made false or misleading statements to induce a purchaser to pay for services in violation of R.C. § 1345.02(A). iv. representing that the subject of the consumer transaction has sponsorship, approval, performance characteristics, accessories, uses or benefits that it does not. v. knowing of the inability of the consumer to receive a substantial benefit from the subject of the consumer transaction. vi. used a sales presentation which makes the material facts of the offer misleading or conveys or permits an erroneous impression as to the services offered for sale. vii. indicating that Kipp’s debt would be reduced to less than what she owed when Defendants had no knowledge that Kipp’s debts could be renegotiated. x. indicating reference numbers “511A-155698,” “511C-155698,” and “BOJ-3950” existed when no such reference number existed.